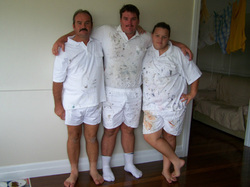 Our painting and decorating business in Gladstone is about making your home or business look great. 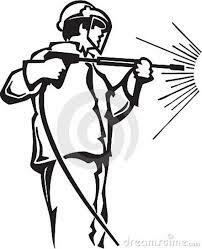 Being professional painters and decorators an important part of our work is looking after your paint job after it is completed. If your paint finish is periodically cleaned and maintained it will last for many years to come . Static electricity causes dust to be attracted to a surface no matter how smooth it is- this is termed static adhesion or some times referred to as static cling. Once dust sticks to the surface it acts as a garden bed for various moulds and algae to grow, these moulds then not only look ugly but they also start to grow into the painted surface just like plants in soil this can cause the paint to prematurely break down and discolour. The only way to truly prevent damage from static adhesion is to regularly clean the surface. Dust and mould will even grow on slippery glass and mirrors if not cleaned off. Our company use specialised high pressure house cleaning equipment combined with quality cleaning products that clean and protect your painted surfaces and also help to inhibit the growth of mould and spiders. Our team at C&B Painters and Decorators can provide you with an affordable yearly maintenance program on our work where they will thoroughly clean and inspect your paint work and repair any small imperfections ,scrapes or stains to keep it in top condition . Click here to ask us for a quote on our maintenance programs. Please tell us how you found our website for a special discount.We have teams in Goomeri, Gladstone and Wide Bay Burnett regions. We also travel to Gladstone,Goomeri,Murgon,Wondai,Woolooga,Widgee,Kilkivan,Tansy,Nanango,Kingaroy, and many other places.